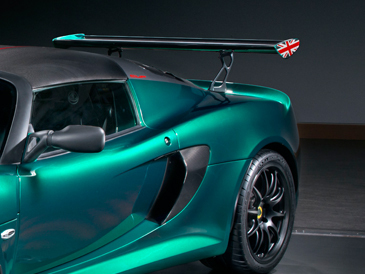 As you would expect, the intense use of ultra-lightweight carbon fibre only adds to the overall performance, as well as reinforcing the Exige Cup 430’s physical presence. 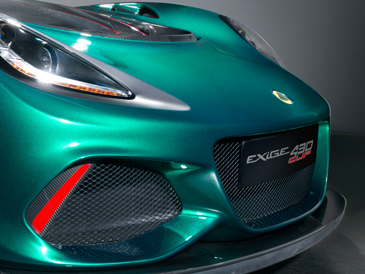 The hand-made composite components include front splitter, front access panel, roof, diffuser surround, large aperture air-intake side pods, one-piece tailgate and the race derived rear wing. 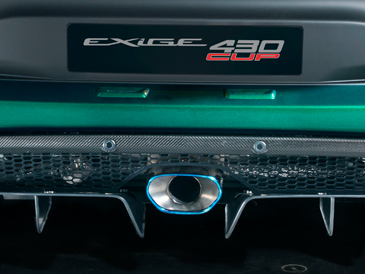 Scratch the surface of the Cup’s capabilities, and you’ll find its motorsport-derived credentials. 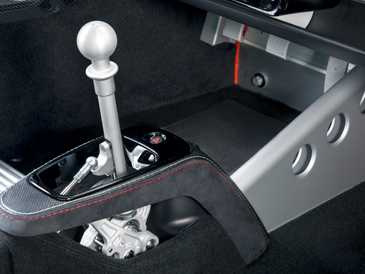 In addition to revised steering arm geometry, to increase bump steer, the car’s handling characteristics can be altered via the introduction of new Nitron three-way adjustable dampers (adjustable for rebound and low and high-speed compression, giving the ability to fine tune the damping) and Eibach adjustable front and rear anti-roll bars, both as standard. 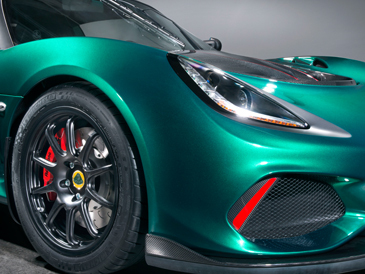 The substantial Michelin Pilot Sport Cup 2 tyres (215/45 ZR17 front and 285/30 ZR18 rear) are fitted to ultra-lightweight forged alloy wheels, available in red, black or silver as standard. 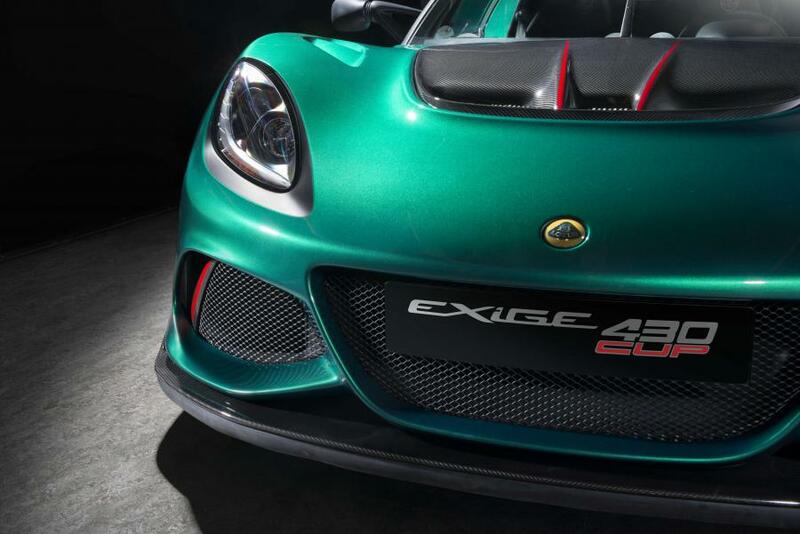 The faster the car, the better the brakes need to be, and the Exige Cup 430 uses some of the largest calipers and rotors of any Lotus road car. With forged, four-piston AP Racing brake calipers and new performance two-piece, J-hook brake discs (with higher thermal capacity) front and back, the system is designed to give improved bite and debris clearance and reduce distortion and vibration and to deliver consistent pedal feel and stopping power lap after lap. 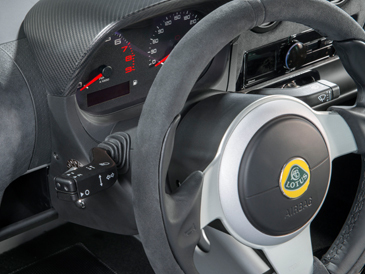 The Cup 430 also comes with a tremendously strong, yet light, T45 steel roll over bar, new seatbelt anchorage frame (saving 1.2 kg), a Lithium-Ion battery and front towing eye as standard, as well as a host of options including, a dealer fit FIA compliant roll cage, electrical cut-off and fire extinguisher controls, airbag deletion and a non-airbag steering wheel.